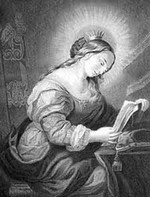 St. Margaret was the daughter of Prince Edward d'Outremer and a German princess Agatha. At the age of twelve she fled to Scotland were King Malcolm II gave her and her family a home. She married King Malcolm and had eight children. St. Margaret died after learning that her husband and sons had been slain in an attack.